Fterolakka and Kelaria are a part of the biggest ski resorts in Greece and they combine high adrenaline with extreme skiing in a cosmopolitan environment just 180 km away from Athens and 25 km from Arachova which is connected to it by a pretty good road which is sometimes icy in the last 15 m so pay attention to avoid accidents. You can start from Athens with your own car following the national road connecting Athens to Lamia leading to Thebes. Then you move on towards Livadia and then to Arachova. From Arachova follow the signs to the ski resort. In 2 and a half hours you will be there. During the weekends you will have a problem finding a parking space if you are there late. Using the public bus you will leave from the bus station of Liosia from where there are two itineraries per day at 9:30 and 12:30. The trip lasts about three hours and the ticket costs €13. Telephone no. (+30) 210 8317173. There is also the ski bus of Klaoudatos which is a store in Athens reaching the resort on a daily basis at 6 or 7 in the morning. Ticket price: €12, telephone no. (+30) 210 5781875. This bus returns as soon as the ski resort closes. The installations in Kelaria start from 1750m while in Fterolakka from 1600m. 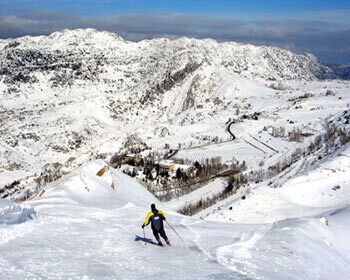 Both of the ski sites end up in Toumborachi which has an altitude of 2300 m.
The resort has 18 skiing sites with a length of 22 km. 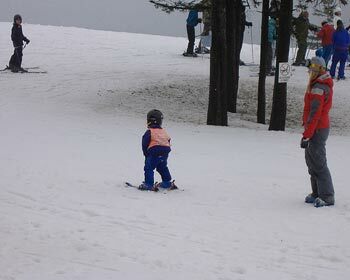 and 2 mini skiing sites for beginners of 30 km with a baby lift. The length of each site ranges from 320m to 3.5 km, and there are different levels of difficulty for beginners or more experienced skiers. The experienced skiers will find outstanding spots outside the pre-determined tracks as well. Two of the skiing sites, Iniohos no. 6 and Vakchos no. 2 have been certified by the F. I. S. Homologation to hold international races. As far as Kelaria is concerned try Aeolos 1, 800m long if you are not a beginner and move on with Iraklis 1 with a length of 1400 m being extra careful of the ice in some spots. If you want to warm up choose Tilemachos, 100 m. Now if you want something more difficult visit Periklis 600m. while Aphrodite is a 110m site uniting the parking with chalet. In Fterolakka you should definitely try Iniochos, the slope loved by all the good skiers and a length of 1100 m. Pythia on the other hand is ideal for those who have just passed the beginning level while the easiest slope of the resort is Pan. There is also a peripheral slope which connects the two resorts with a length of 3500 m and a downward inclination. 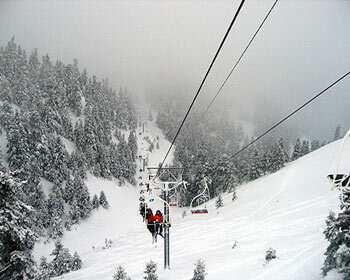 There are 13 lifts, four-seat cabins leading from the base to the chalet. In Kelaria you can go up by a funicular with two, three, four or single seats and you will also find baby lifts. Fterolakka has a funicular with three-seat lifts or single ones. Each of the funiculars has its own name which corresponds to the slope with the same name. Daily 8.30-16.00 from December to May. On weekdays, early in the morning when there aren’t many people on the lifts and you will easily find a parking space. If you don’t like crowds avoid visiting the ski center on weekends. The daily card of unlimited rides for weekdays costs €12 while on the weekends it is €27. The weekly card will cost you about €80 while the yearly card costs €450 and the children’s card about €30 for children up to ten years old. For the funicular the cost is €3 on weekdays and €6 on the weekends. People spotting is probably the best off snow sport in ski resorts. In the chalets of Parnassos you will have the opportunity to enjoy hot cups of tea and local dishes at the restaurant while there is also a daycare center. The Fterolakka chalet is smaller but cozy and hospitable as well. Drink "tsipouro" to warm up and continue skiing the next day. The oldest school on the premises is Pappos-Baldoumis and you will find it on the central square of Arachova, tel. no. (+30) 22670-31552/31746. One hour lessons cost €15-40 per person depending on whether this is a private lesson or not. There are other schools as well such as Mpoumpa tel. no. (+30) 22670-31781 and Pro Shop tel. no. (+30) 22670-31558. Private lessons cost €30 and group lessons €20 per person. There are plenty of stores offering ski equipment in Parnassos. In Livadi, Arachova, you will find everything you want in Klaoudatos’ store tel. no. (+30) 22670-31457. The prices for jet skis start from €15 and for the snowboard sets from €20. The ski resort has its own store as well with stock in boots, snowboards and so on. The resort is going to stay open for more time starting from this year. The lifts will be in operation 08.00-16.00 and later if the weather permits it. 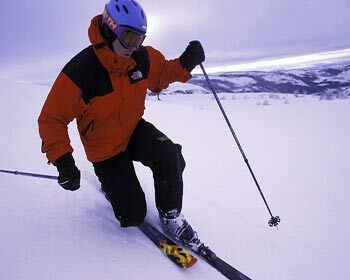 In addition, night ski parties will take place depending on weather conditions. 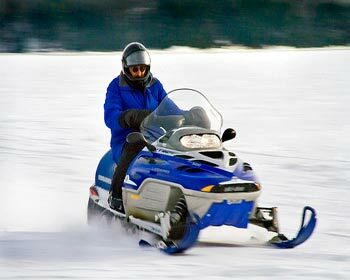 You can rent a snowmobile or a slay and explore all the slopes or use the lifts to admire the view from high points. You can also try to ice skate. The staff of the ice rink, White Satin, will help you make your first steps tel. no. (+30) 22670-32655. Entrance and ice skates cost €9 and €6 for students and pupils. The most difficult but most loved slope in Kelaria is Odysseus. 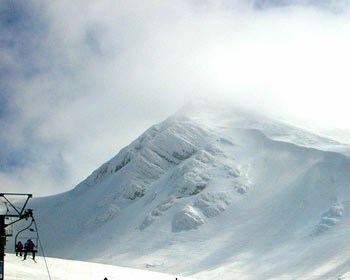 In Fterolakka there’s the excellent breath-taking black slope called Sahara which is only for experienced skiers. 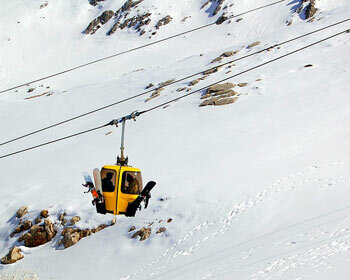 It has a length of 2000 m and it starts from the top of Anovrisi accessed only through Zeus’ lift. Santa Marina Arachova Resort and Spa is situated on the slope of traditional Arachova built with natural materials, mainly wood and rock according to the local architecture. 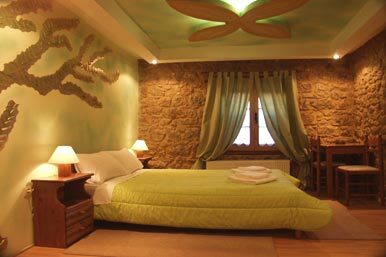 Prices: from €200 for the double room, tel. no. (+30) 22670-31230. Boutique Hotel Skamnos is full of finesse and details that make a difference. Great breakfast with pure ingredients, a wellness center for relaxation and prices ranging from €75 for a double room are all characteristics of the hotel. Afanos guest house is the best accommodation choice if you want to stay in the center of Arachova. This 19th century mansion offers ten hospitable rooms with a view to the village or the main square decorated in a unique taste. Prices range from €90 for a double room. Tel. no. (+30) 22670-31514. Generalis guest house has popped out of a fairytale offering great view and rooms with a great decoration. Prices range from €70 for a double room. Tel. no. (+30) 22670-31529. 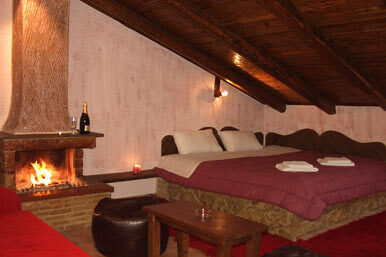 If you decide to stay in Delphi stay in all time classic Amalia. Four buildings spread on a garden offering an incredible view of Itea is what you will come up with. Prices range from €150 for a double room. Tel. no. (+30) 22650-82101. 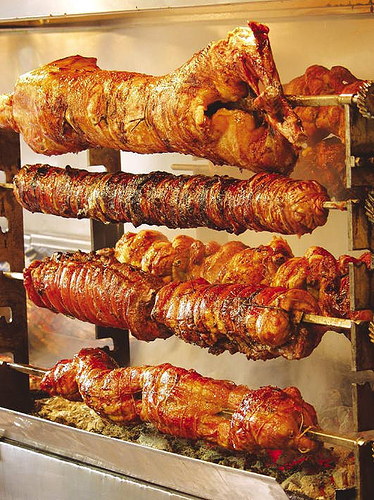 Panagiota will offer you traditional dishes so tasty that you won’t believe it. The environment is cozy and friendly and the service is excellent. try the grilled chops and pay about €17 per person. Tel no (+30) 22670-32735. You will find Agnandio right next to the school with a view towards Arachova. Try the stuffed lamb, pork with chylopites, and pork stifado. Prices range from €14 per person. Tel no (+30) 22670-32114. Karaouli is a traditional taverna loved by locals as well. It offers delicious meals, local delicacies such as sausages and excellent chicken cooked with wine. Don’t forget to taste the sweets. Prices range from €18 per person. Tel no (+30) 22670-31001. By taxi tel. no. (+30) 22670-31566. Parnassos (+30) 22340-22700, Kelaria (+30) 22340-22693, Fterolakka (+30) 22340-22373.